Gardening with flowering plants can be a wonderfully fulfilling hobby. Whenever the plants begin to flower, they’ll surely bring a smile to your face to see all your hard work paying off. If you’ve already got a garden and are facing problems with intrusive weeds, this article has some helpful tips. Let us guide you in effectively eliminating those pesky intruders so they can stop stealing valuable nutrients from your beautiful buds. If you’ve used mulch before, you’ll know it’s a form of chopped wood you can place along your topsoil. This method is both attractive and effective, preventing weed growth by depriving them of sunlight. You can find mulch easily and affordably at many local garden shops and feed stores. 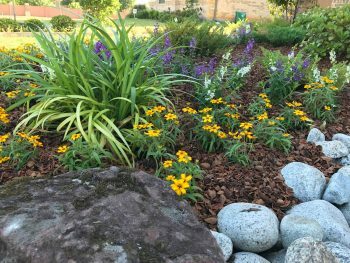 In addition to weed control, mulch offers your flower bed a great meal down the line, as it begins to decay. The decomposition process enriches your soil with healthy nutrients. Manual weeding is always an option if you don’t mind getting down in the dirt. However, you should take on this task when the weed is ready to be pulled, and no sooner. If done too early, you risk leaving the root behind, allowing it to regrow. If there are spaces between your plants and the offending weeds, selective watering can discourage weed growth. Just spot-water the plants directly to ensure adequate hydration. But keep in mind that, for grass beds, there are better methods than spot-watering. To ensure a lush and weed-free lawn, be sure you check out other helpful articles on this matter. Dandelions (among other weeds) produce flowers and pollen, allowing them to grow and multiply quickly. If you encounter these foes, be sure you chop off their heads (the flower itself) to prevent them from further propagation. With vigilance, this method will eventually eliminate the whole crop of invaders. Some fertilizers are also effective at killing weeds. This type can feed your flowers while starving your weeds, making it a valuable tool. Be on the lookout for products that boast this dual action when you’re out shopping for lawn care supplies. Now that you know the basics for growing a beautiful, pest-free garden, it’s time to get out there! Get in the dirt and get going on that lovely lawn project you’ve been planning. With the right tools and knowledge, gardening can bring joy and beauty to your life. Be sure you check out other helpful lawn care articles to enhance your gardening experience. I am getting read to redo my flower bed since the weather is becoming more balanced again. It is quite the sight. I have weeds and a few dead plants that will have to come out. I wrote down some notes as I read this. I will see what I can come up with. I want to try and tackle this myself. If I need to hire someone, I may be in touch real soon.